DSV Locker Solution Wins Platinum Award At Logistics Achiever Awards 2018, SA. The Logistics Achiever Awards recognize professionalism and excellence in the effective application of strategic, tactical, and operational logistics and supply chain management principles, concepts, and practices in Southern Africa. DSV was proud to collect a major award for their innovative locker solution, supported by TZ. DSV’s challenge was to meet customer and new business needs which encompassed both B2B and B2C, whereas DSV traditionally operated in the B2B space. In particular, managing higher volumes of lower value, single shipments to variable addresses was not consistent with DSV’s business model. The emergence of e-commerce accelerated the need for a solution which bridged the business-consumer divide. 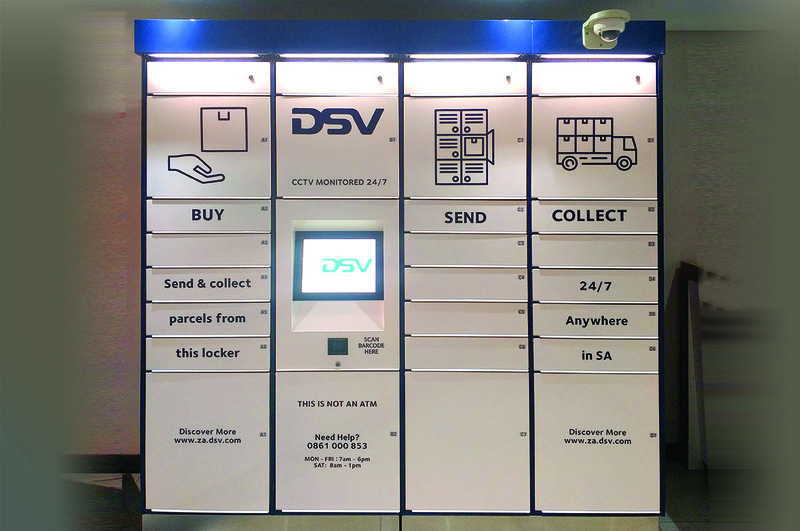 The DSV Locker solution was designed to complements and work with any supply chain solution and solves challenges in both B2B and B2C markets. This solutions delivers significant benefits for retailers too – reducing cost associated with re-delivery and returns; simplifying the delivery process while enhancing security; providing a strict chain of custody with transactions recorded from start to finish (including CCTV); and freeing up valuable in store space from storage and collection points. It is anticipated there will ultimately be more than 450 DSV Lockers countrywide as DSV meets a growing need in many sectors.